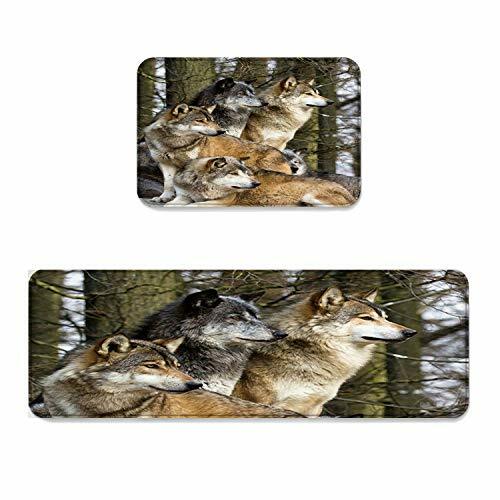 Beauty Decor 2 Piece Non-Slip Kitchen Mat Runner Rug Set Wild Animal Doormat Area Rugs Wolf Family Sit in The Forest Landscape 19.7"x31.5"+19.7"x63"
Beauty Decor 2 Piece Non-Slip Kitchen Mat Runner Rug Set Wild Animal Doormat Area Rugs Wolf Family Sit in The Forest Landscape 19.7''x31.5''+19.7''x63'' by Beauty Decor at Animal Backgrounds. MPN: CXC20180920-BDMTSETSLEO00231MDECBDR. Hurry! Limited time offer. Offer valid only while supplies last. Why Choose Beauty Decor Door Mat/ Kitchen Mat set / Bath mat Set? 1.The durable surface is waterproof, stain resistant and easy to clean. 2. Why Choose Beauty Decor Door Mat/ Kitchen Mat set / Bath mat Set? 1.The durable surface is waterproof, stain resistant and easy to clean. 2. Affordable prices that fit any budget, without sacrificing quality. 3.The mat is very practical and decorative. With the non-slip design, you can stand on it easily and comfortablely. The kitchen floor mat needs folding when packed for transportation, so there will be creasing temperarily. It will be disappear when unfloding it for several time. DIVERSIFIED CHOICES - 4 sets choices: 15.7"x23.6"+15.7"x47.2", 19.7"x31.5"+19.7"x47.2", 19.7"x31.5"+19.7"x63",23.6"x35.4"+23.6"x70.9"
2 Piece Non-Slip Kitchen Mat Runner Rug Set Animal Decor Doormat Area Rugs Lovely Fox with Autumn Leaves 19.7"x31.5"+19.7"x63"
Beauty Decor 2 Piece Non-Slip Kitchen Mat Runner Rug Set Stripe Doormat Area Rugs Geometric Patchwork Animal Leopard Zebra Print Stylish Design 23.6"x35.4"+23.6"x70.9"
Beauty Decor 2 Piece Non-Slip Kitchen Mat Runner Rug Set Animal Doormat Area Rugs Elephant with Heart Shaped Flowers 23.6"x35.4"+23.6"x70.9"
Beauty Decor 2 Piece Non-Slip Kitchen Mat Runner Rug Set Animal Doormat Area Rugs Dog Paw Prints 19.7"x31.5"+19.7"x63"
Beauty Decor 2 Piece Non-Slip Kitchen Mat Runner Rug Set Grey Doormat Area Rugs Elk Shadow Creative Animal Art Design 23.6"x35.4"+23.6"x70.9"